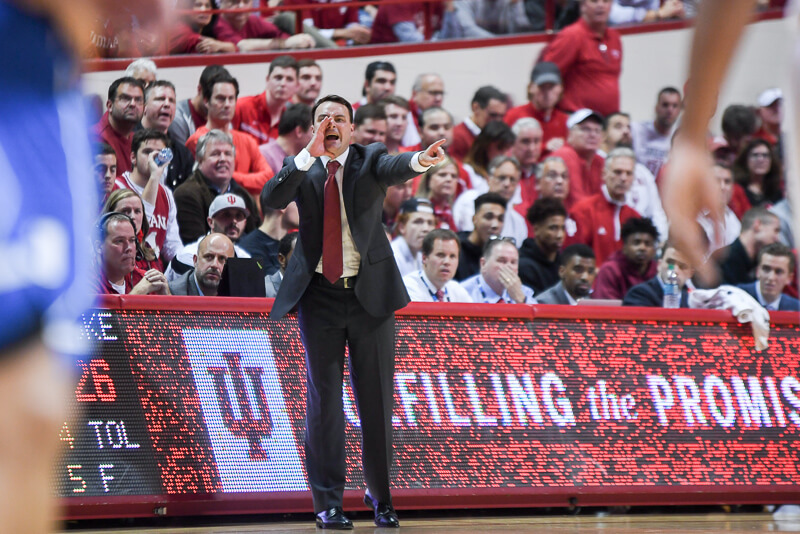 Inside IU basketball with Archie Miller was live on Thursday evening at the Holiday Inn in Bloomington. Juwan Morgan was the player guest. · When asked who have been the on-court leaders, Miller named Collin Hartman, Robert Johnson, Josh Newkirk and Juwan Morgan. · Miller said Devonte Green is the team’s best guard at being creative, executing pick-and-rolls and post feeds. · Miller said Juwan Morgan is the player whose play in-game most mirrors practice performance. · Regarding Michigan, Miller said Charles Matthews is a potential All-Big Ten player, and that Moritz Wagner will be tough for Indiana’s frontcourt to guard. · Juwan Morgan said he prides himself on being consistent in every game. · Morgan said the freshmen class is a lot less stubborn than he was at that age, and are more willing to learn from the upperclassmen. Me too, I’m a happy Hoosier camper right now! Juwan is by far our most consistent player and one of the most important. When Deron gets in foul trouble as he does most every game, from a defensive perspective it is not that concerning to me anymore bc Juwan is able to guard the post just as well if not better than Deron. It’s nice too know what you are getting with him going into every game, which I don’t think can be said of any other player besides maybe Colin. Offensive efforts against IU could easily have their #1 priority as going strong at De’Ron to try to get some early fouls and sit him on the bench. Exactly what happened in the Duke game, except most times the teams coming to SSAH will not bring their own refs. But on the road, De’Ron will be easy prey. He was at times last year. Let’s hope a year of experience, conditioning and knowing his team needs him on the floor adds to some additional minutes played every game. Teams take on their coaches personality over time and I think that bodes well for the future. These aren’t originally Archie’s guys, but seems the transition is already taking effect. I agree with you partly, but IIRC his second foul, the one that had him sitting all but 5 minutes of the first half, came from him being careless on a double team. That is the kind of thing that he just absolutely has to correct, cause as you say the other team is going to go at him stronger and more often until he proves that that isn’t a help getting their team a win. Just as I think his free throw shooting will get better, I think his defense will as well. The way he played the second half made it look like the minutes spent watching the game from the player assistant coach’s seat hit home. Looks in so many ways like the very feeling you got when watching a good Bob Knight team. I would tell opponents to “try” and get in your licks now because this is going to get better with each and every game. Remember that early in the summer Knight gave addressed Miller’s hiring and indorsed it. It didn’t get much coverage but he said it and I am beginning to see why. Yes I do remember that and Knight wouldn’t have said that about any old coach!!! It’s a good feeling knowing that we may not always have the best team on the floor but we will have the best coach on the floor!! Back in the day when RMK roamed the sidelines I never doubted that we had the best coach on the floor! !